Ebenezer House is a double fronted detached villa with a date (1912) and name stone set in the centre of the upper storey above the porch. It is similar in style but smaller than a number of villas built by James Walker between 1899 and 1910. It was actually built for his own occupation by Albert Squires, who worked for a time for James Walker and his son Billy before beginning work on his own account as a jobbing builder. The deeds bundle includes some original invoices for materials used to build the house. The hallway has an attractive Minton tiles floor similar to others in Bingham of this age. The land was originally leased from the Earl of Carnarvon who in 1920 sold the freehold to Mr Squires. 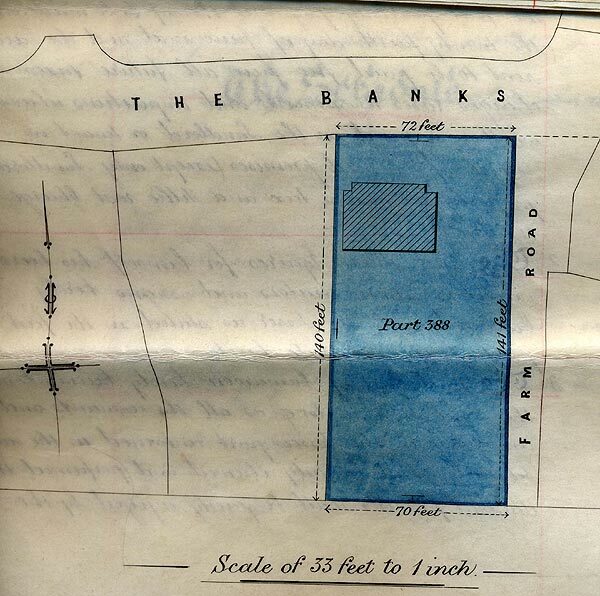 Towards the end of 1920 Squires purchased an additional piece of land adjoining the property. The deeds record various mortgages and the eventual division of the two properties to various members of the Squires family, in one of whose ownership the house is still vested (2010). 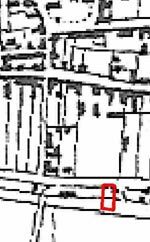 The parcel of land on which Ebenezer House now stands was plot 293, outlined in red on the tithe award map of 1841 (left), and had a building at its north east corner. This is still present and used as a store. This building was also shown on the 1883 map. The plot was occupied in the 1841 census by agricultural labourer James Holt. It was described as a house, pigcote and garden. James would seem to have kept a pig or two to supplement his living as a labourer. His descendants seem to have occupied the cottage until after 1901. The adjacent plots 293 and 291 (an unoccupied field) of 18 became plot 388 on the map of 1883 (right) but still divided in two and still with a building at the north east corner. The building is also shown on the Ordnance Survey map of 1901. Although east wall of the present outbuilding near the north east corner is clearly built of large bricks, the rest is of narrow brick which together with the pantiles of the roof suggest this is the remains of Holt’s cottage. The outbuilding used to extend to the front wall; the original wall apparently showed signs of blackening through burning, betraying the former location of the fireplace perhaps. As an aside, the 1835 map (left) does not show Banks House, the large farm house opposite Ebenezer House, but the map for 1841 does, which strongly suggests a date for the farmhouse of the late 1830s. This was Agnes Musson’s homestead in 1586. 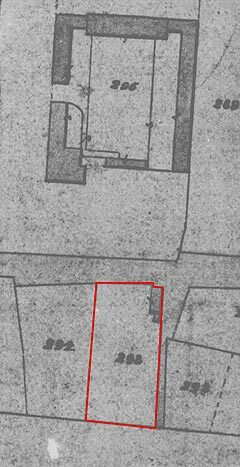 On 16th June 1913 The Earl of Carnarvon leased to ‘Albert Squires , builder, of The Banks, a plot of ground measuring one thousand one hundred and eight square yards together with the messuage thereon as delineated by a plan attached to the lease’ (below). Before he moved into Ebenezer House Albert had lived for a few years at 17 The Banks. The lease ran for 99 years from 25th March 1913 and the rental was £4.0.0.pa. What is now a public footpath to Toot Hill School is shown on the plan as a ‘farm road’, giving access to various fields. The lease imposed a range of covenants on the lessee, including the obligation to paint the exterior of the house every four years and the interior every seven. Squires had to seek agreement to assign the lease to any subsequent lessee or to erect further buildings. The present long outbuilding on the eastern boundary is not shown on the plan, but seems to be the remains of the old cottage that used to be here. He had to insure the house for £350 and was not to use it for a workshop, public house, beer house or for sale of alcoholic liquor or for any noisome noxious noisy or offensive trade or business whatsoever but a private dwelling house only. These were standard conditions the Earl always imposed. Whether Squires was in breach of them when he set up business as a jobbing builder using the property as his yard we can only guess – it may be this came after purchase of the freehold. The invoice for bricks seems to have been issued somewhat late! Building the house seems to have left Squires a little short of cash, or maybe he was raising capital for his business venture, as on 26th July 1913 he mortgaged the property for £150 at 4%pa to Miss Alice Maud Lowe of Northampton. We have no record of who she was or how Squires came into contact with her. She may have been a relative as was sometimes the case in such instances. On 15th April 1920 The Earl of Carnarvon signed an agreement to sell the freehold to Squires, confirmed in a conveyance document dated 22nd June 1920. The agreement was a pre-printed form of which we have seen examples before (e.g. 12 Church Street). We also seen examples of the handwritten conveyance of the freehold in other deed bundles – here we have both! 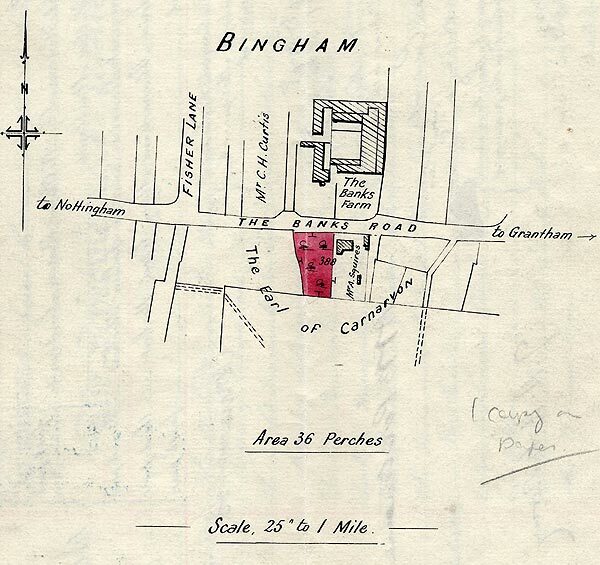 The Earl sold many freeholds in Bingham in 1920; we think to help fund his support of the archaeological excavations by Howard Carter in Egypt, which culminated in the discovery of the tomb of Tutankhamen. 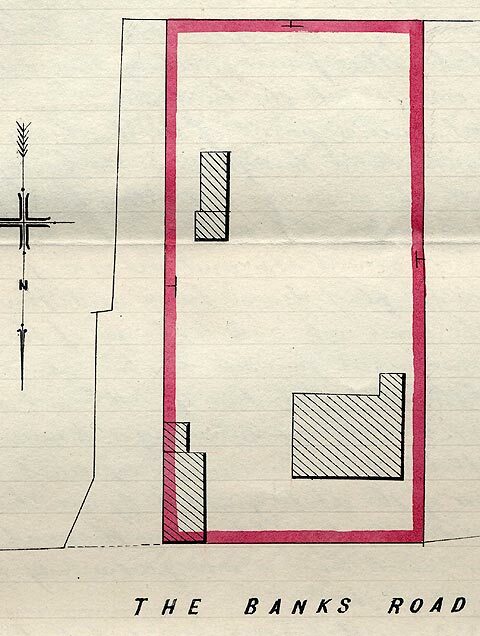 The price for the freehold was £100, the plan attached (above) shows the outbuildings. 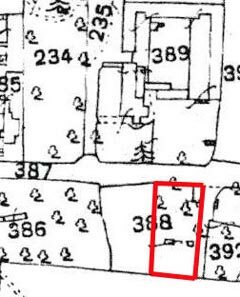 On 3rd December 1920 Squires purchased the freehold of a plot of land, measuring 36 perches (about 1100 square yards) coloured red on the plan, below, adjacent to Ebenezer House (the other part of the 1883 plot 388) which the plan shows to have been an orchard. This cost £50. The conveyance document carries a later memorandum noting that Albert Squires transferred a third of this land by deed of gift to Henry Squires (one of his two sons) on 18th May 1936. Henry built the bungalow ‘Greenways’ on this plot. 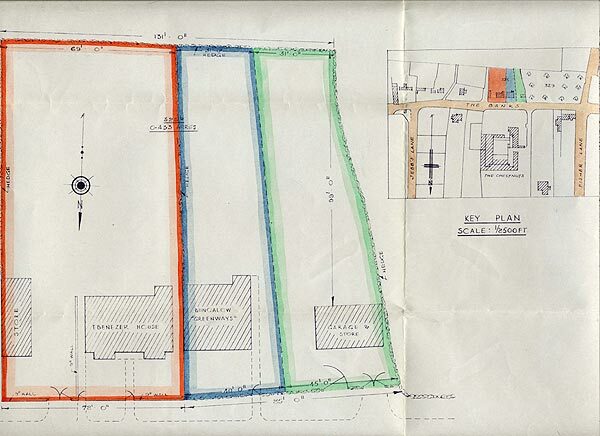 The plan shows part of a piece of land opposite as being in the ownership of Mr C H Curtis. This was the orchard of what is now Long Acre House. The electoral roll for 1920 shows Curtis as being at ‘The Chestnuts’, confirming our assumption that this was yet another name given to the original Providence House not an alternative name for Banks House – shown on the plan as The Banks Farm. As always the Earl reserved the mineral rights in both transactions. The loan from 1913 was repaid on 31 October 1932 when Miss Lowe was resident at The Cottage Hospital Wellingborough and presumably in a position where she needed to call in her debts. The next day Squires took a mortgage for £320 at 5% interest with Miss K L Eden of Craigmore, Watcombe Circus in Nottingham, using the house as security. Again, this may have been to provide working capital, just as his former employer James Walker had done many times! On 12th July 1949 Albert Squires sold the house to his son-in-law, Reginald Mabbott, ‘Foreman of Trades’ for £600. We know from family sources that this was when daughter Dorothy and her husband moved into Ebenezer House to care for Albert in his old age. They had previously lived at Sutton House, Newgate Street, another of James Walker’s semi-detached villas. The plan, above, attached to this conveyance shows how the whole of plot 388 was now divided between Albert’s son-in-law and his sons Henry and Lewis. We know how the plot was divided from information supplied by the family. Incidentally, this plan shows Banks House, opposite, incorrectly labelled as ‘The Chestnuts’, a misreading of the OS map by the draftsman. Mr Mabbott took out a mortgage with the Refuge Assurance Company and in 1973 gave one half to his wife by deed of gift.